Thank you for being a part of the REALTOR® community, now over 1.3 million members strong. As a REALTOR® member, the National Association of REALTORS® is here to support and assist your professional growth every day. We’re deeply engaged in all facets of real estate, strengthening your business and the entire industry, to ensure your success and the opportunity for all Americans to achieve the dream of home ownership and enjoy the benefits of investing in real property. ADVOCACY: NAR advocates every day for federal, state, and local policy initiatives that strengthen the ability of Americans to own, buy, and sell real property. EVENTS & NETWORKING: NAR provides hundreds of opportunities across the country to meet and build relationships with fellow REALTORS® and future customers. SAVINGS: Your membership entitles you to discounts on vehicles, technology tools, shipping, cell phone plans, computers, car rentals, office supplies and many more business-related needs. EDUCATION: Expand your knowledge and explore new interests with training and tools covering multiple areas of real estate, advanced training for areas of specialty, publications, research reports and more. 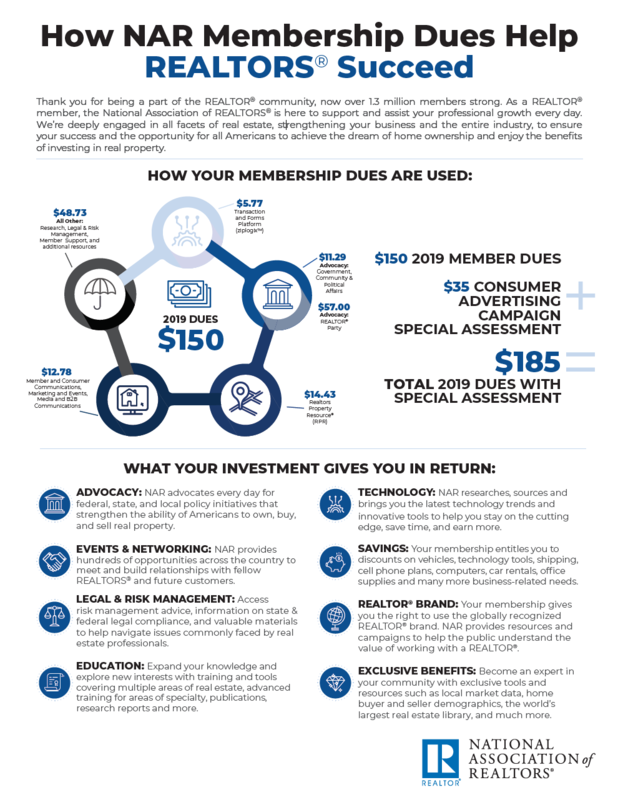 EXCLUSIVE BENEFITS: Become an expert in your community with exclusive tools and resources such as local market data, home buyer and seller demographics, the world’s largest real estate library, and much more. LEGAL & RISK MANAGEMENT: Access risk management advice, information on state & federal legal compliance, and valuable materials to help navigate issues commonly faced by real estate professionals. REALTOR® BRAND: Your membership gives you the right to use the globally recognized REALTOR® brand. NAR provides resources and campaigns to help the public understand the value of working with a REALTOR®.